Scrapping of Tai Solarin University of Education: Ijebu-Egba War Imminent! [float=left] [/float] The Wednesday 8th February announcement that scrapped the Tai Solarin University of Education (TASUED), Ijagun, Ogun State is one that will dominate discussions in the state for some time to come. Apart from the given educational reasons, some have chosen to view the move made by the Ibikunle Amosun administration from political perspectives. Nigeria’s first ever specialized University of Education was on Wednesday scrapped by the Ogun State government while the Information and Communication Technology polytechnics in the state were merged. The history of the University of Education cannot be divorced from the Tai Solarin College of Education which was originally established in 1978 as Ogun State College of Education. The college was established then to produce middle level manpower for schools and colleges in Ogun State and by extension, Nigeria. It was however upgraded and transformed to a University of Education on the 29th January, 2005 by the Gbenga Daniel administration. According to Mr. John Odubela, the Commissioner for Education, Science and Technology, TASUED has been converted to an institute under the Olabisi Onabanjo University, Ago Iwoye with immediate effect. The authorities of the scrapped institution have been directed to stop further admission of students, especially for the 2012/2013 academic session. 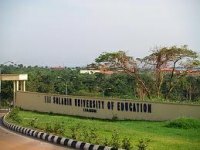 The campus of the university would also be moved to Omu Ijebu where the State’s College of Education is currently located. The College of Education will however be relocated to Ijagun. The four ICT Polytechnics; Kessington Adebutu ICT Polytechnic, Saapade, Abraham Adesanya ICT Polytechnic, Ijebu Igbo, D.S Adegbenro ICT Polytechnic, Itori and Ayodeji Otegbola ICT Polytechnic, Igbesa, all of which were established in 2006 have also been merged into one institution called Ogun State Institute of Technology. While Igbesa will serve as the main campus of the new institution, the three others will operate as satellite campuses. And in order to preserve the name of Ayodeji Otegbola, the Government has decided to rename the Egbado Teachers’ Training College, Ilaro Ayo Otegbola Teachers’ Training College. In many quarters, the action of the Amosun administration is being viewed as a demotion of the institutions concerned, especially the Tai Solarin University of Education. TASUED students have also called on the Governor to reverse the decision. Though the Government claims to have taken the decision based on the recommendations of the various visitation panels to the institutions, it was found out that the decision was arrived at in a bid to reduce the number of tertiary institutions funded by the state. The Commissioner disclosed that the move was to “salvage the standard in the education sector and to protect the interest of the generality of the citizens of the state.” He also said “less than 40% of the courses offered in TASUED are Education related. Those not favourably disposed to the government’s decision have however opined that if the institution lacked anything in terms of quality, manpower or infrastructure, it would not have been accredited by the National Universities Commission. One other cause for deliberation within the state is that the Amosun administration took the decision without carrying the legislature along thus putting the legality of the decision to question. In some quarters, the move has been termed political and some Ijebu indigenes are seeing it as a move against their kin by the Governor who is an Egba man. It is believed in the state that Egbas believe in marginalising other parts of the state to their own advantage. To some, it is direct way of reducing the institutions in Ijebuland. Others see it as a political agenda to erase the achievements put in place by Otunba Gbenga Daniel. Not a few indigenes have wondered how an institution like the Tai Solarin University of Education that has been described as one of the fastest growing universities be merged with Olabisi Onabanjo University whose standards have fallen considerably. Those who see the action as pure bad blood have chosen to base their argument on the premise that instead of building on the few good things left by the immediate past administration, Governor Amosun has decided to throw away the baby with the bath water. Politically speaking however, it is already being discussed in hushed tones that the Governor’s decision might bring about a clash between Ijebus who are the worst hit by the educational reforms and the Egbas, Governor Amosun being an Egba man. Political analysts have pointed out that even the slot being used by Governor Amosun now should have gone to the Yewa/ Awori region of the state. By an unwritten arrangement, all the other three divisions of Ogun State (Egba, Ijebu and Remo) have presented Governors of the state. Chief Olabisi Onabanjo, an Ijebu man ruled the state between 1979 and 1983. The Egbas had their turn through Aremo Olusegun Osoba who ruled twice while Remo produced the immediate past Governor, Otunba Gbenga Daniel. That was why the other political parties fielded people from the Yewa axis. The in-fighting between the PDP went a long way in jeopardizing its chances as it led to splits in the party causing the then Governor’s loyalists to move to the People’s Party of Nigeria (PPN) thus leaving Amosun and the Action Congress of Nigeria as beneficiaries, despite the fact that the party’s candidate was not from the Yewa division. Some people have also alleged that lately, the Governor has been hobnobbing with former President Olusegun Obasanjo hence his move against perceived opponents. The Governor’s actions however will definitely generate reactions from affected regions both politically and otherwise. Those who think it is too early in the life of the administration to start making controversial moves are already saying the Ijebus will be waiting for the Governor and by extension the Egba population at the next elections.